Synastry - Friend/Foe, maybe more? Hello. 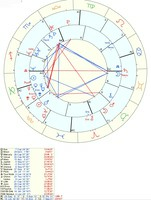 I posted a synastry and composite chart with (as of right now) a friend of mine. Lately, it's been hard to deal with him and his mood swings/anger. He's really stressed/depressed (he would never admit the depression, and I don't press it, but it's obvious). I have been feeling crazy mixed emotions from him. I realize it probably isn't me, but his issues. It's still difficult, though. One minute, I think he hates me (lashing out), but the next, he acts normal, continues to talk and help me out when needed. I avoid him if I sense the stress. I want to know if anyone has any advice looking at the charts - if there is potential for more than a friendship (sometimes I sense more, but then the "crazy" overshadows it), and how I should go about it. If not, I would still like to know how to better handle him as I don't want to abandon ship just because he's going through a rough time, though I may if he doesn't get help. If you need more info I'm happy to provide it. (I'm the blue in synastry.) Thank you. I or someone will try to answer your question as soon as possible. Stellium in Capricorn, maybe you met through work? Cap in Sun/Venus with loose Moon in Taurus trine; this explains you coming together and having some connection (friendship, relationship) but no guarantee yet. Nice dynamic between Moon and Mars; happiness or energised around each other? Some grand trines along with Moon/Saturn aspects for glue. Just in fixed signs it can be more difficult due to the nature of fixed signs. Your Gemini Moon vs his Taurus Moon makes you more likely to adapt to his ways. I would say potential is there, but he does look more inflexible than you. You might get tired of this over time. Attraction is there in the charts too. Could you provide a first meeting chart too? We work for the same company, for a while in the same account. He started in October 2016, but I don't know the date, sorry. I have been there longer, though. I have no idea if he knows how I feel, but I don't think it's a reciprocated attraction, or maybe he acts the way he does because he thinks I'm not interested. I guess I'd like to know if the synastry points to attraction from his side, too. i've never explicitly said anything to him, though I have given compliments/told him I appreciate him, and the like. He is one of the more "unique" people I've met, not a typical guy. He gives off a sort of cold vibe, rarely talks about women, and is extremely willful. Others have commented that he's a stick-in-the-mud, and I see that at work, but not outside work so much. He's just been really moody and stressed lately, especially with and around me. He does open up at times, and some days are good, others not so good, terrible even. He's the type I feel might run if there are too many emotions, but I'm kind of the same. Neither of us has had a relationship in a very long time. So I don't know if I should even bother. There are a lot of hard Saturn and Pluto aspects in our synastry, too, and I'm wondering if that's going to kill everything. That ok's fwf82, just wanted to look at the first meeting chart; October 2016 would have not been a bad time with Sun and Jupiter both in Libra. His "stick in the mud" nature which comes across to others is what I described as inflexible. That is just the way he is, it seems. Too many Saturn or Pluto aspects may lead to arguments in the long run; however you'll probably stick together and feel/think about each other a lot. If he tells you secrets he doesn't share with others; then you know he likes you. But again his ways have already been identifed. Maybe stay on good terms with him now if you work together or at same company. I try. We don't work together anymore, so not a big deal as far as being nice. Pulled back a lot lately because of his attitude, but am still friendly. We'll see how it plays out. Might be stuck for a while with him mentally, and vice versa, ha ha. Thanks for your insight. No problem; i hope everything goes good for you. Let me know how things go; or if something changes.